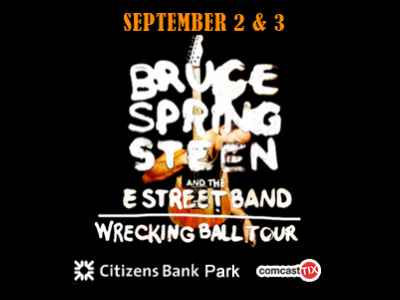 Bruce will hit Citizens Bank Park, home of the Philadelphia Phillies, over Labor Day Weekend, and with those concerts, will become the first act to perform at every major live music venue in the city, according to Ike Richman at sports and entertainment firm Comcast Spectator. Starting as early as 1973, Bruce has frequented the now-demolished venues of the Spectrum, Veterans Stadium, and JFK Stadium plus currently active venues Tower Theater, Electric Factory, Lincoln Financial Field, and Wells Fargo Center. According to Billboard.com, "Springsteen previously accomplished an unprecedented feat in Philadelphia music history when his tour traveled a distance of 758-feet, nine-and-a-half inches in less than one day from the Spectrum to the Wells Fargo Center to perform on back-to-back nights in September of 1999. The feat was submitted to the Guinness of Book of World Records as the shortest jump ever for a tour."